Not everyone understands what hospice care is, or what hospice care teams – physicians, nurses, home health aides, social workers, chaplains and volunteers – actually do. Not only for people who are very ill, but for their caregivers, too. So, educating the public about it continues to be critically important. One unique and moving way to do that was organized by the Louisiana-Mississippi Hospice and Palliative Care Organization: a traveling exhibit of artworks created specifically to convey “the compassion and dignity that hospice provides,” LMHPCO executive director Jamey Boudreaux told me. It took a lot of thought and a fair amount of time to organize the project. A competition was launched in 2013 at the organization’s annual conference, where member hospices were encouraged to find an artist they could work with. But before the artists could apply paint brush to canvas, to get a better sense of the work, they were to go through hospice volunteer training and then spend time shadowing hospice team members. After that, they created a variety of works in different media, including paintings, sculpture, stained glass and photography. In 2014, a group of art critics and artists judged the work of 40 artists, representing 40 member hospice agencies, and selected the 16 finalists that would make up the traveling exhibit. “A Window Into Hospice,” by Tammy Hromadka. Six panels set in an old window frame, each showing the hands of a caregiver. Shown here is artist and musician Tammy Hromadka’s “A Window Into Hospice.” Ms.Hromadka volunteers at CHRISTUS Cabrini Hospice’s Grace Home in Alexandria, Louisiana. As Jamey Boudreaux pointed out, though, “The Art of Hospice” wasn’t just an art exhibit. Over an 18-month period, each of the 10 venues in Mississippi and Louisiana also presented educational courses for physicians, nurses, CNAs, chaplains and volunteers. The public at large also attended sessions devoted to advance care planning. The exhibit stayed in each venue for three or four weeks. “It raised the level of awareness about hospice in these communities,” Boudreaux said. 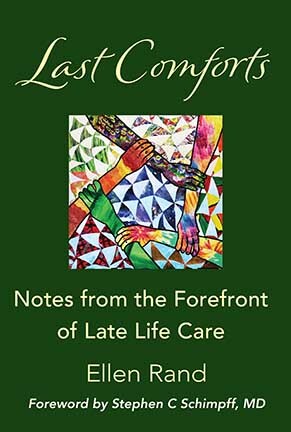 Still, LMHPCO found that there was much misinformation or misunderstanding to address about what hospice is all about. Some people were unaware, for example, that hospice is not just “the government coming in to take over for family members,” Boudreaux explained; or that it does not provide 24-hour care; or that there are private agencies – nonprofit and for-profit – that provide this care. The traveling exhibit involved many logistical challenges and was a one-time event. Boudreaux has talked about the art project with fellow hospice organization executives, but so far none have sought to replicate what LMHPCO did. Most of the artworks have been returned to the artists and the remaining few soon will be returned. So what does the education committee of LMHPCO do for an encore? The focus will be on providing care for the homeless and for those who are the so-called “un-befriended” — people who do not have caregivers, at the organization’s upcoming conference. I’m eager to see its creative approach to professional and public education after that.